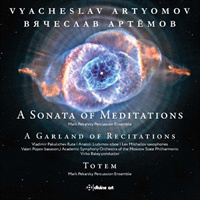 VYACHESLAV ARTYOMOV (b.1940): A Sonata of Meditations, Totem (Mark Pekarsky Percussion Ensemble), A Garland of Recitations (Vladimir Pakulichev [flute], Anatoli Lubimov [oboe], Valery Popov (bassoon), Academic Symphony Orchestra of the Moscow State Philharmonic; Virko Baley). Description: These three works are from the 1970s, predating the polyglot vocabulary of Artyomov's hugely impressive tetralogy Symphony of the Way or the monumental Requiem (11U062). They are in a way more 'conventionally experimental', if that makes sense; their idiom must have been riskily experimental in Brezhnev's USSR, and would have been fatal in Stalin's. A Garland of Recitations is a half-hour single span of inexorable slow momentum. Contemporaneous with the Symphony of Elegies (10U062), it occupies a similar soundworld, sonorous, tectonic and largely unrelated to the customary processes of Western music. As we said of the symphony, its orchestral part is " ... very slow and consists mostly of amorphous string textures, often shifting and overlapping in planes of dissonant intervals and clusters, with no development." Also, as in the symphony there are intermittent bell tones and magmatic upheavals. Here, however, this evolving texture is the background to the recitations of the four soloists, taking turns to step forward and deliver long-breathed melodic lines like archaic bardic songs in an unknown language, or ritual chants, rough, primitive and barbaric. These extended solos have an improvisatory, poetic quality - if the improvisation is that of the most avant garde free jazz, or the poetry declaimed in whispers, shouts and stentorian recitation. Inspired by Varèse’s 1931 Ionisation, Artyomov was drawn to writing for percussion ensemble in the 1970s. The Sonata is a substantial work in four movements; much of three of them consists of imaginative use of the very large percussion group, often in unpitched textural sonorities, to evoke meditations proper to the time of day; the shimmering emerging light of morning, evening contemplation, and nocturnal phantasmagoria. Only the afternoon movement is highly rhythmic, a thrilling ritual of drumming. Totem, also for a massive percussion group, also suggests ritual, its incantatory outer sections enclosing a vigorously rhythmic central episode.